May Report: Quantum Dot, Flexible display, Active pen, and touch screen - Touch Display Research, Inc.
Santa Clara, California, May 8, 2018—In the recently published “Touch and Emerging Display Monthly Report,” Touch Display Research Inc., a market research and consulting firm, analyzed the technology and market trends: quantum dot, flexible display, active pen market, bio sensor, and touch screen, etc. “Quantum dot is rapidly growing beyond display and lighting, it is used in image sensor, solar, battery, laser, agriculture, bio-science, medical labeling, etc. Investors have started pouring funds into material suppliers and flexible display companies. The active pen industry is going through re-shuffling, and the market forecast is provided in this report. At the end of May 2018, I will fly to Los Angeles for the SID DisplayWeek conference. I am excited and honored to be invited to teach a Monday seminar at SID DisplayWeek again. 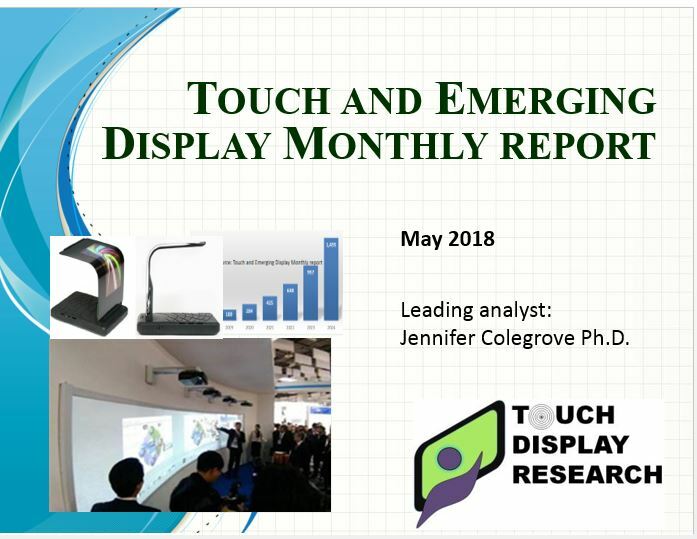 I will be teaching a 90-minute seminar titled ‘Display and Emerging Technologies Market Forecast – LCD, OLED, e-paper, touch screen, smart windows and voice recognition.’,” said Dr. Jennifer Colegrove, CEO and Principal Analyst of Touch Display Research Inc., who has authored reports on the touch panel and emerging display industry for over ten years. The May 2018 report is available immediately.